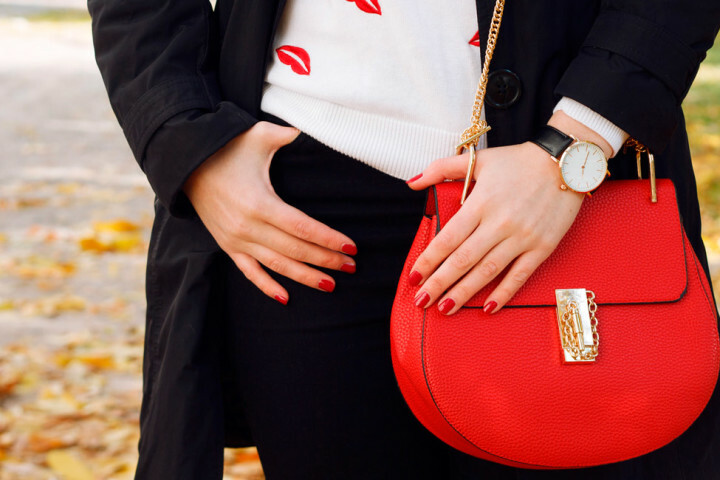 Pace-setting modern wristwatches for both men and women have been at the fashion forefront since Movado introduced the Museum Watch in 1947. With streamlined Bauhaus inspired styling created by artist Nathan George Hewitt, the Movado Museum watch defined modern timepieces for many decades. The original watch featured an ultra-slim and perfectly round case in polished yellow gold presented on a black lizard strap. The iconic dial featured only two slender gold-tone finished sword hands and a single round dot accent at the 12 o’clock hour on a black background. A sweeping second hand and hour marker indicators were absent on the Museum watch dial, adding to its thoroughly modernistic design and appeal. The Museum Watch stands today as a paragon of modern time. The Museum of Modern Art in fact added the watch to its collection in 1960. 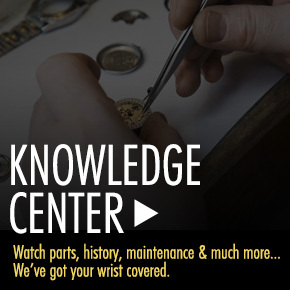 Interestingly, the Museum watch is now considered a Classic Watch icon having been around for close to 70 years. 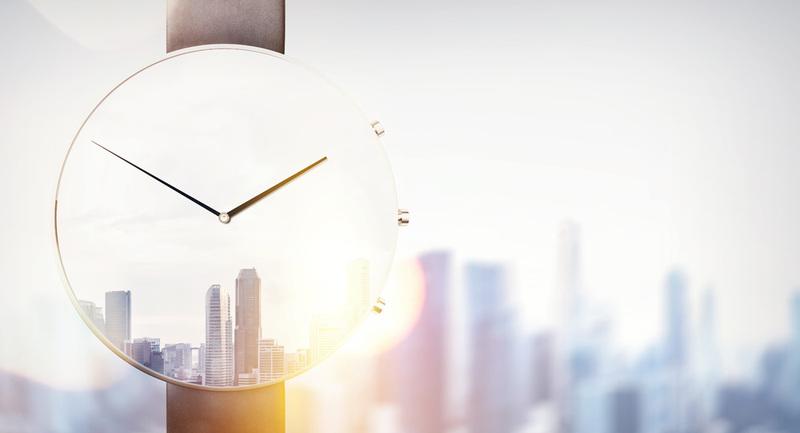 Many of today’s modern timepieces have a futuristic tone and appeal, while others adhere to more streamlined and minimalist characteristics. 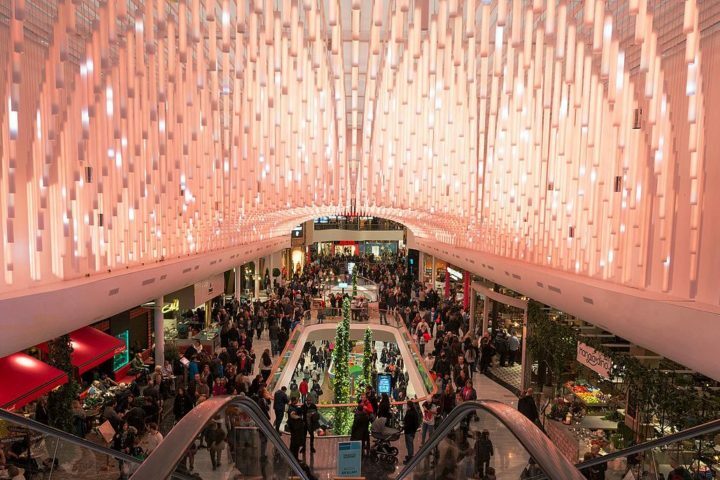 Modern, contemporary watches are the focus of attention this week at WorldofWatches.com with their Ultra-Modern Styles promotion, featuring popular men’s and women’s styles from Rado, Elini Barokas, Braun, Invicta, Egard, IceLink, Nixon, Gucci, Momo Design and more. 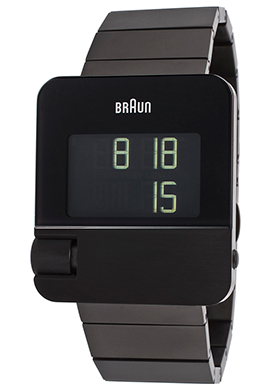 The Braun Prestige digital men’s watch is an ultra-sleek modern watch choice. The rectangular shaped case in black ion-plated stainless steel in a satiny brushed finish is presented on a striking horizontal link bracelet in black ion-plated steel. The black dial with green digital read-outs features an Easy-Scroll operating system, along with alarm, chronograph, stop-watch, month and day functions. This German made watch is 37mm wide, 10mm thick and is water-resistant to 30 meters. 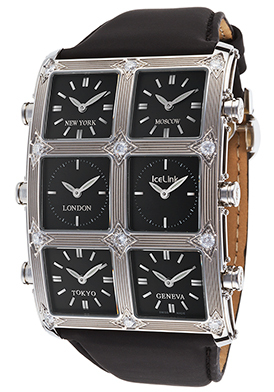 The IceLink Ambassador men’s watch makes a highly modern statement with a bold, elongated rectangular shaped case in stainless steel that measures 40mm in width and a smooth black polyurethane strap. Outstanding timepiece features six individual dials with multiple time zones from New York, Moscow, London, Tokyo and Geneva. Each separate watches features black backgrounds, silver tone hands and baton hour markers. Twelve shimmering diamonds accent the polished stainless steel bezel with fluted detail separating each of the dials. 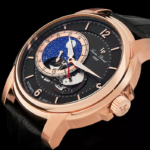 Features include sapphire crystals above the dials, premium Swiss-made quartz movement and water-resistance to 30 meters. Both the Elini Barokas Captain Black timepiece and the Invicta I-Force chronograph offer futuristic modern design. 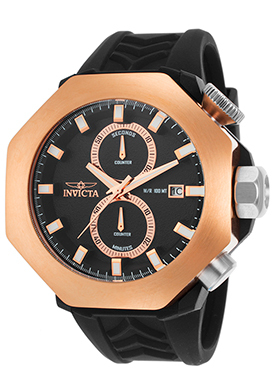 With an octagonal shaped case in black ion-plated stainless steel and a 18K rose gold plated octagonal shaped bezel the Invicta I-Force chronograph is bold and ultra-modern. The striking black silicone strap with raised detail adds to the striking design. The black dial has two subdials, a date calendar, luminous hands and hour indices. Features included quality quartz movement inside and water-resistance to 100 meters. 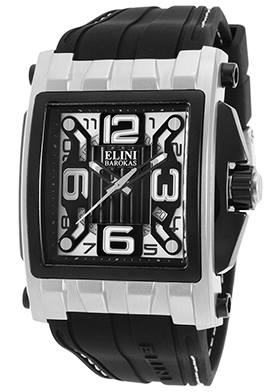 The new Elini Barokas Captain Black watch is ultra-bold and masculine with a robust 44mm wide, 51mm long case in brushed and polished stainless steel with decorative raised detail on the lugs. The black silicone strap with contrasting white-stitched detail adds distinction. The widescreen dial with a fluted background in black and white features skeleton hands, Arabic numeral quarter hour markers and a semi-skeleton date calendar. 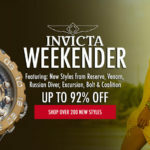 Invicta Weekender: Fresh New Styles Up to 90% Off.